Fold together the Pastry Cream and the Lemon Curd. Set aside until ready to use. Cut the danish dough, dock, and then bake as directed. Once cooled, assemble by piping the Lemon Curd mixture with a round tip onto the puff leaving space to alternate with a blackberry. Repeat until the whole surface is covered. Then place another strip of puff on top and repeat the same process. Top off with another strip of puff. Make a plaquette with transfer sheet 616965 to fit the size and once set place on top. Cut the Blackberry Gelee into squares and place around the edges, decoratively. 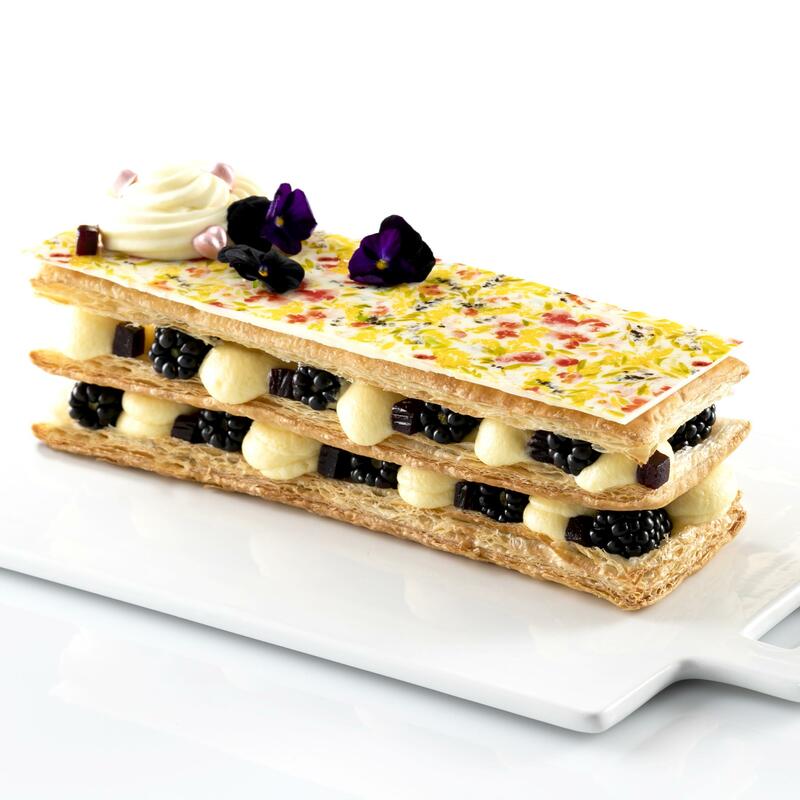 Finish the mille-feuille with some of the Lemon Curd Mixture, blackberry gelee squares, and blackberries. In a mixer fitted with a whisk, combine ingredients and whip on medium high speed for 3-5 minutes. Bloom the gelatin in cold water and reserve. Warm the puree to 180°F/82°C with the sugar. Melt the bloomed gelatin, add to the puree, and then emulsify well.